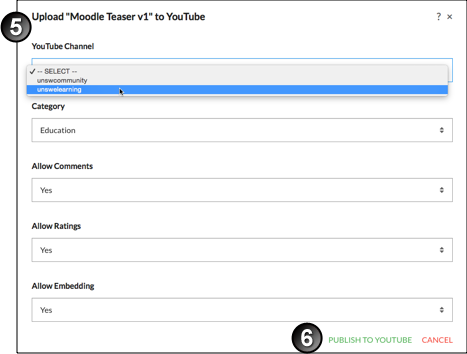 theBox/Moodle integration is not currently functional due to Youtube changes. Please see the known issues page for more information. Uploading to and taking down from the UNSW Youtube channel(s) from theBox can take some time, the process is typically not instant. Note: The UNSW Community playlist has previously been known as the AboutUNSW playlist. You must first upload the video to theBox prior to uploading to YouTube. On the Dashboard in the Videos card, click the link You have X videos. On the list of videos, locate the video you wish to upload to YouTube and click the cog icon. YouTube Channel - this is the channel you want to upload to. You can upload to the unswelearning or unswcommunity channel. On the list of videos, locate the video you wish to remove from YouTube and click the cog icon. Click the Take Down button. Click the + icon and choose the YouTube playlist icon. Restrict Access To - this is a theBox setting and determines if the playlist can only be viewed by yourself in theBox or if you wish to share it with all staff. 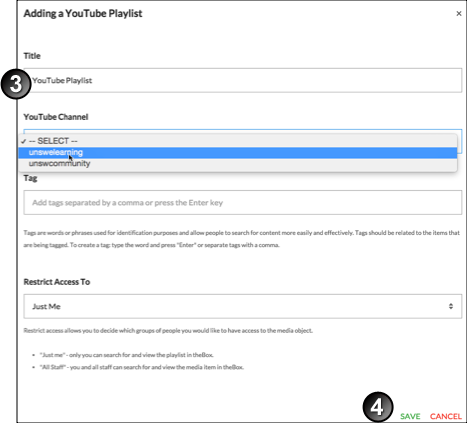 On the Dashboard in the YouTube playlist card, click the link You have X YouTube playlists. Search for and click on the YouTube playlist you wish to add a video to. 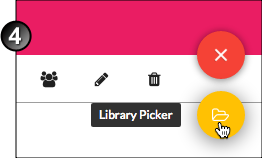 Click on the + button and choose Library Picker. Search for the video you wish to add. Click the checkbox beside the video and click Done.